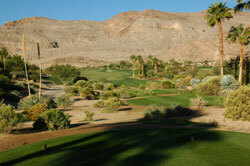 Private Las Vegas country club review Play available for members and guests only- NO public play! 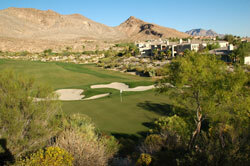 Red Rock Country Club in Las Vegas is an upscale private facility with a wide range of amenities available for members and guests. The clubhouse features a pro shop, a restaurant and lounge with wonderful views, locker rooms with showers and steam rooms for men and women, plus banquet and meeting facilities. Adjacent is recreation center with lit tennis courts, a swimming pool plus fitness center. Fitness classes (including Yoga for Golfers and TRX for core stability, strength and flexibility) of various types are offered, as are spa and massage treatments. Members and guests enjoy comprehensive practice facilities that include a double-ended, targeted grass range, short game area with sand bunkers, plus spacious putting green. Gorgeous mountain scenery is complimented by exquisite desert landscaping with plentiful palms and tropical foliage throughout the property. 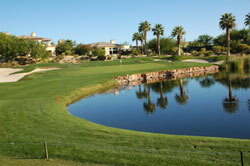 The Mountain Course at Red Rock Country Club is a spectacular desert mountain design featuring sculpted tee areas, rolling manicured fairways, and a nice variety of finely conditioned green complexes. Cascading streams and waterfalls add aesthetic beauty to create an unforgettable golf experience. Landscaping from tee to green is exceptional, and golfers will appreciate the mountain vistas and variety in design that includes several elevated tees and pristine water hazards. There are 7 sets of tee boxes, affording golfers of all skill levels with an opportunity to choose distances and slopes that match their game. The Gold's play to 7001 with a 143 slope while the Black's measure 6488 yards/135 slope. The Gold/Black combo tee measures 6668 yards with a 142 slope. Average players can choose the Blues which play to 5992/120 slope, or the Whites which measure 5429/120 slope. 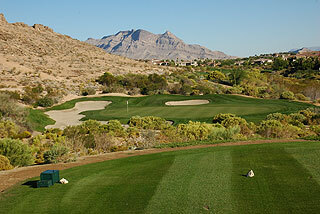 The Green tees measure 4937 yards/113 slope and the White/ Green plays to 5211 yards/120 slope. Water hazards come into play on 3 holes and 54 soft sand bunkers are situated near the landing areas off the tee or greenside. 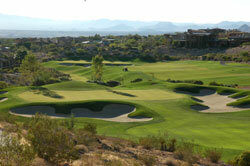 The sand traps come in different sizes and shapes but are often sprawling and can definitely be a factor. The par threes are exceptional as a group, with the 197 yard 7th the best of the group, as it plays from an elevated tee that provides gorgeous desert mountain views. 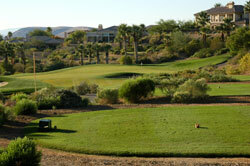 On the back side it is easy to lose concentration on the par four 14th and par three 15th. 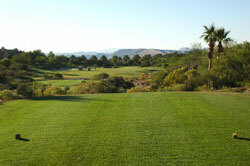 The former features a cascading waterfall to the left and the latter is a gorgeous par three sculpted into the foothills with a beautiful mountain backdrop. Golfer looking for membership will have a difficult time finding a course that offers more…in the way of beauty – with a combination of challenge and playability. Choose the back sets and your work is cut out for you. 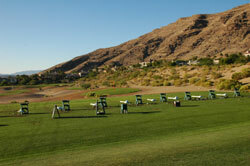 Play up a tee box or two and this can be a relaxing day. Pin placement charts are mounted on each golf cart. 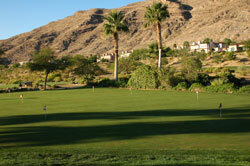 The Mountain Course and Red Rock Country Club provide an excellent option for those seeking membership in a top notch facility. Remember – this course is NOT OPEN for public play. For more info visit our listing page with link to the properties' website by clicking here.